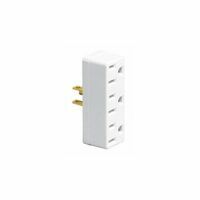 Cooper Wiring Outlet Adapter, Grounding, 125 VAC, 15 A, 1 Outlets, 2 Wires, 2 Poles, NEMA 1-15R - NEMA 5-15R, Polypropylene, White, cULus Listed, Plug-In Connection Leviton Outlet Adapter, Grounding, 125 V, 15 A, 1 Outlets, Single Tap Terminal, 3 Wires, 2 Poles, NEMA 5-15R/1-15R, Vinyl, Gray, UL E-13394, CSA LR-61476, For Use With 1 Straight/Angled Polarized Plugs Spring action plug provides cord grip for easy storage on appliances such as vacuum cleaners, fans, etc. Made of high impact-resistant thermoplastic for long-term durability. Cord diameter 0.328". Listed to UL 498 (file no. E15012) NOM Certified. Meets flammability requirements per UL 94, VO rated. Temperature rating: -20 to +60 degrees C. NEMA 1-15. 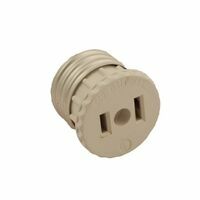 Spring action plug provides cord grip for easy storage on appliances such as vacuum cleaners, fans, etc. Made of high impact-resistant thermoplastic for long-term durability. Cord diameter 0.328". Listed to UL 498 (file no. E15012) NOM Certified. Meets flammability requirements per UL 94, VO rated. Temperature rating: -20 to +60 degrees C. NEMA 1-15. Meets all UL 498 requirements. Plug blades firmly embedded in body. Size: 1.48" wide x 1.19" tall. 15 amp, 125 volt. .312" cord diameter. NEMA 1-15. Impact resistant thermoplastic housing with finger grip grooves. Plug blades are firmly embedded in body. Polarized. NEMA 1-15, UL Listed. Carded. 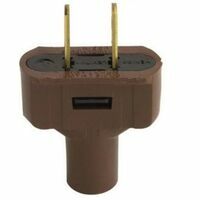 Leviton Easy Wire Plug, Non-Polarized, 2 Poles, 2 Wires, 10 A, 125 V, Nema 1-15P, Cord Mounting, Non-Grounding Grounding, Male Connection, 5-1/2 in Overall Length, 2-1/2 in Overall Width, Brown, UL Listed, CSA Certified, For Residential Applications Spring action plug provides cord grip for easy storage on appliances such as vacuum cleaners, fans, etc. Made of high impact-resistant thermoplastic for long-term durability. Cord diameter 0.328". Listed to UL 498 (file no. E15012) NOM Certified. Meets flammability requirements per UL 94, VO rated. Temperature rating: -20 to +60 degrees C. NEMA 1-15. 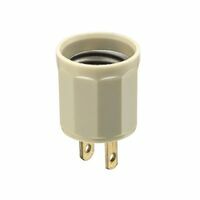 Spring action plug provides cord grip for easy storage on appliances such as vacuum cleaners, fans, etc. Made of high impact-resistant thermoplastic for long-term durability. Cord diameter 0.328". Listed to UL 498 (file no. E15012) NOM Certified. Meets flammability requirements per UL 94, VO rated. Temperature rating: -20 to +60 degrees C. NEMA 1-15. Leviton Electrical Plug, Light Duty, Polarized, 2 Poles, 2 Wires, 20 - 16 AWG Wire, 15 A, 125 V, Nema 1-15P, Cord Mounting, Non-Grounding Grounding, Straight Connection, Thermoplastic, Brown, UL Listed, CSA Certified, 1/4 in Cord, For Commercial/Industrial and Residential Applications Connects a 3-conductor grounded plug to a 2-conductor polarized receptacle. 15A/125V/1875W. 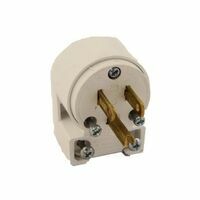 Connects a 3-conductor grounded plug to a 2-conductor polarized receptacle. Primelight? indicator light shows when the power is on. Grounding retainer ring. Size:1.20" D X 3.90" W X 6.75" H.
UL Listed, (file no. E15055). Meets all UL 496 and 498 requirements. CSA certified, (file no. 1739 (6231-04). NOM Certified. Temperature rating: -40 to +65 degrees C. 250 volt, 660 watts. UL Listed, (file no. E15055). Meets all UL 496 and 498 requirements. CSA certified, (file no. 1739 (6231-04). NOM Certified. Temperature rating: -40 to +65 degrees C. 250 volt, 660 watts. Meets all UL 498 requirements. Plug blades firmly embedded in body. Size: 1.48" wide x 1.19" tall. 15 amp, 125 volt. .312" cord diameter. NEMA 1-15. Leviton Lamp Holder Adapter, Non-Grounded, 660 W Lamp, 125 VAC, Medium Base, 2-Wire Terminal, Wall Mounting, Phenolic, Ivory, 2-Pole, NEMA 1-15R Leviton Lamp Holder Adapter, Non-Grounded, 660 W Lamp, 125 VAC, Medium Base, 2-Wire Terminal, Wall Mounting, Phenolic, Brown, 2-Pole, NEMA 1-15R High impact-resistant thermoplastic housing with finger-grip grooves. Blades are firmly embedded in body. Insulation piercing terminals, snap in unstripped wire. 15 amp, 125 volt. For cord sizes 16-2 and 18-2 SPT-2, 18-2 and 16-2 HPN. NEMA 1-15. High impact-resistant thermoplastic housing with finger-grip grooves. Blades are firmly embedded in body. Insulation piercing terminals, snap in unstripped wire. 15 amp, 125 volt. For cord sizes 16-2 and 18-2 SPT-2, 18-2 and 16-2 HPN. NEMA 1-15. Converts a single receptacle into three outlets. Molded of high impact-resistant plastic for long-term durability. 15 amp, 125 volt. UL Listed. Converts a single receptacle into three outlets. Molded of high impact-resistant plastic for long-term durability. 15 amp, 125 volt. UL Listed. Standard grade. Meets all UL 498 requirements. Plugs blades are firmly embedded in body. 15 amp, 125 volt. .32" cord diameter. Straight, NEMA 5-15. Converts one outlet to three grounded outlets. Converts one outlet to three. Converts one socket to two sockets. 250 volt - 660 watts. UL Listed. Converts one socket to one socket and two side outlets. 125 volt - 660 watts. UL Listed. Converts one socket to two sockets. 250 volt - 660 watts. UL Listed. Converts a single receptacle into three outlets. Molded of high impact-resistant plastic for long-term durability. 15 amp, 125 volt. UL Listed. Standard grade. Meets all UL 498 requirements. Plug blades are firmly embedded in body. 15 amp, 125 volt. NEMA 5-15. UL Listed. General duty, meets all UL 498 requirements. Plug blades are firmly embedded in body. 15 amp, 125 volt. .328" cord diameter. NEMA 1-15. Terminals are in individual chambers to positively insulate conductors. Terminal screw clamps are designed to contain wire and prevent binding. Terminal screws backed out, ready for wiring. Resists chemical attack and stays flexible in extremely low temperatures. Combination slot/Phillips head mounting and terminal screws. 15 amp /125 volt. UL Listed. 1.54" diameter x 1.65" tall. .25" -.63" cord diameter. NEMA 1-15. Converts one socket to one socket and two side outlets. 125 volt - 660 watts. UL Listed. 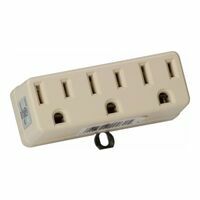 Converts a single receptacle into three outlets. Molded of high impact-resistant plastic for long-term durability. 15 amp, 125 volt. UL Listed. 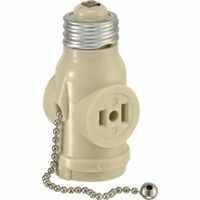 Leviton Outlet Adapter, Grounding, 125 V, 15 A, 3 Outlets, Triple Tap Terminal, 3 Wires, 2 Poles, NEMA 5-15R, Vinyl, Orange, UL E-13394, CSA LR-61476, For Use With 3 Straight/Angled Polarized Plugs Meets all UL 498 requirements. Solid brass straight plug blades. Combination slot/Phillips head mounting and terminal screws. 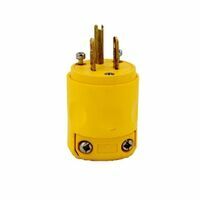 Temperature rating: -20 to +60 degrees C. 15 amp, 125 volt. .250"-.600" cord diameter. UL Listed, CSA Certified. NEMA 5-15P. 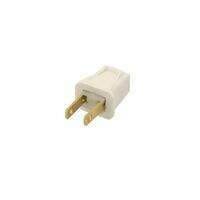 Converts duplex receptacle to six outlets. Molded of impact resistant plastic. 15 amp, 125 volt. Molded of high impact-resistant plastic for long-term durability. Converts one outlet to three grounded outlets. 15 amp, 125 volt. UL Listed. 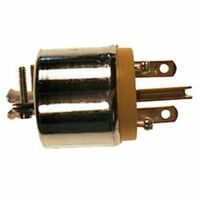 For international use with dual voltage appliances or with electricity converters/transformers. 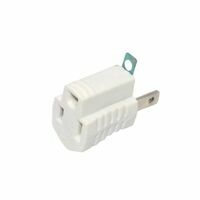 Adapts to outlets found in North/South America, Caribbean, Japan and for European appliances used in U.S. For international use with dual voltage appliances or with electricity converters/transformers. 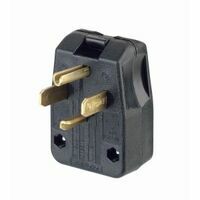 Adapts to outlets found in parts of Great Britain. Solid brass plug blades. Armored housing automatically grounded. Combination slot/Phillips head mounting and terminal screws. Terminal screw clamps. 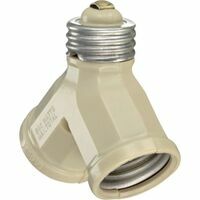 Fits Cooper Connector 2887, Orgill SKU 435.2878. 15 amp, 125 volt. NEMA 5-15 configuration. UL Listed, CSA and NOM Certified. Standard grade. Plug blades are firmly embedded in body. Resists chemical attack and stays flexible in extremely low temperatures. Large handle with solid brass blades. Polypropylene, PVC and thermoplastic rubber. Meets flammability requirements per UL 94. 15 amp, 125 volt. -20 to 70 degrees C. NEMA 1-15. Boxed. Converts one socket to two sockets. 250 volt - 660 watts. UL Listed. Porcelain body. Temperature rating of -40 to +65 degrees C. UL Listed, (file no. E15055), CSA certified, (file no. 1739 (6231-04)), Meet all UL 496 requirements, Meets CSA requirements, C22.2 no. 43. NOM certified. 250 volt, 660 watts. 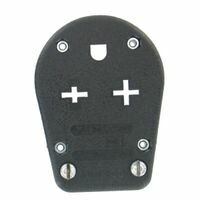 Converts one 2 pole polarized outlet to three, 3 wire grounding outlets. 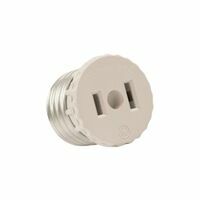 Grounding lug fastens to wall plate mounting screw for excellent ground connection. Solid brass blades. Molded of thermoplastic. UL Listed. Socket to outlet, keyless switch. UL Listed, (file no. E15055). Meets all UL 496 and 498 requirements. CSA certified, (file no. 1739 (6231-04). Temperature rating: -40 to +65 degrees C. 125 volt, 250 watts. Socket to one socket and two side outlets. Pull chain controls lampholder. Side outlets are always on. 125 volt - 660 watts. UL Listed. Socket to one socket and two side outlets. Pull chain controls lampholder. Side outlets are always on. 125 volt - 660 watts. UL Listed. 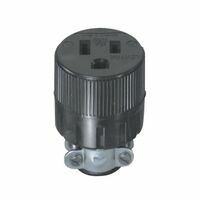 Converts one 2 pole polarized outlet to three, 3 wire grounding outlets. 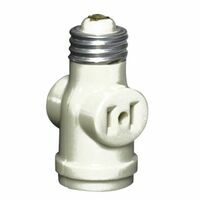 Grounding lug fastens to wall plate mounting screw for excellent ground connection. Solid brass blades. Molded of thermoplastic. UL Listed. Converts a standard grounded wall outlet into 6 grounded outlets. 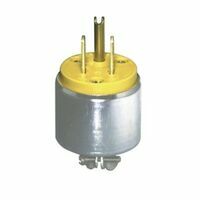 Rated 15 amp, 125 volt and 1875 watts.. UL Listed. Socket to one socket and two side outlets. Pull chain controls lampholder. Side outlets are always on. 125 volt - 660 watts. UL Listed. Socket to one socket and two side outlets. Pull chain controls lampholder. Side outlets are always on. 125 volt - 660 watts. UL Listed. Molded of thermoset plastic. Solid brass plug blades are firmly embedded in body. Resists chemical attack and is less brittle in extremely low temperatures. With terminal screw clamps. Combination Slot/Phillips head mounting and terminal screws for installation flexibility (Slot/ Robertson screws in Canada where available). Terminal screws backed out, ready for wiring. Yellow color. Meets all UL 498 requirements. Converts one outlet to three outlets. 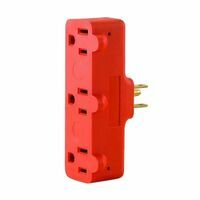 Converts a single receptacle to three outlets. 15 amp, 125 volt. UL Listed. Solid brass plug blades are firmly embedded in body. Resists chemical attack and is less brittle in extremely low temperatures. With terminal screw clamps. Combination Slot/Phillips head mounting and terminal screws for installation flexibility (Slot/ Robertson screws in Canada where available). Terminal screws backed out, ready for wiring. Yellow color. Meets all UL 498 requirements. Molded of high impact-resistant plastic for long-term durability. Converts one outlet to three grounded outlets. 15 amp, 125 volt. UL Listed. Molded of high impact-resistant plastic for long-term durability. Converts one outlet to three grounded outlets. 15 amp, 125 volt. UL Listed. Standard grade. Meets all UL 498 requirements. Terminals in individual chambers to positively insulate conductors. 15 amp, 125 volt. .32" cord diameter. Straight, NEMA 5-15. Standard grade. Meets all UL 498 requirements. Terminals in individual chambers to positively insulate conductors. 15 amp, 125 volt. .32" cord diameter. Straight, NEMA 5-15. 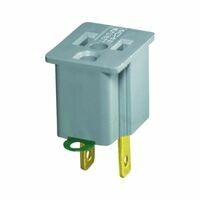 Leviton Outlet Cube Adapter, Grounding, 125 V, 15 A, 3 Outlets, Triple Tap Terminal, 3 Wires, 2 Poles, NEMA 5-15R, Vinyl, Green, UL E-13394, CSA LR-61476, For Use With 3 Straight Plugs Leviton Outlet Adapter, Grounding, 125 V, 15 A, 3 Outlets, 3 Wires, 2 Poles, NEMA 5-15R, Vinyl, Orange, UL Listed, CSA/NOM Certified, Plug-In Connection, Polarized Plug, Single to Triple Tap, For Residential Applications Converts one outlet to three. Swivel feature hugs cords close to wall in tight-fighting places such as behind furniture and office equipment. Solid brass blades for long life and low heat rise at full load. Flammability meets UL 94 requirements. Temperature rating: -20 to +60 degrees C. 15 amp, 125 volts. cULus, evaluated to UL498A. Converts one outlet into three. Power tap with photocell nightlight. 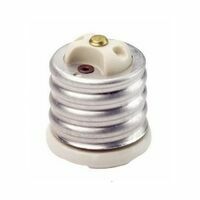 Photocell turns nightlight on at night, off at dawn. Rated 15 amp, 125 volt and 1875 watts. Meets all UL 498 requirements. Solid brass straight plug blades. Combination slot/Phillips head mounting and terminal screws. 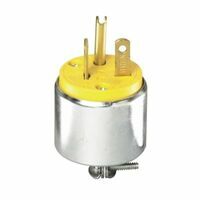 Temperature rating: -20 to +60 degrees C. 15 amp, 125 volt. .250"-.600" cord diameter. UL Listed, CSA Certified. NEMA 5-15P. Solid brass plug blades are firmly embedded in body. Resists chemical attack and is less brittle in extremely low temperatures. With terminal screw clamps. Combination Slot/Phillips head mounting and terminal screws for installation flexibility (Slot/ Robertson screws in Canada where available). Terminal screws backed out, ready for wiring. Yellow color. Meets all UL 498 requirements. Orange, heavy duty. Molded of high impact-resistant plastic for long-term durability. 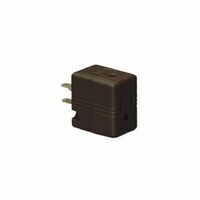 Converts a single grounded receptacle to three grounded outlets. 15 amp, 125 volt. NEMA 5-15 configuration. Not for use in wet locations. UL Listed, file E15054, meets all UL498 requirements, CSA certified, file 2054 (6224-01). NOM Certified. Converts one outlet into six. 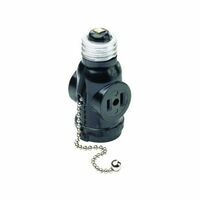 Power tap with photocell nightlight and safety covers. 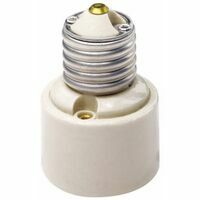 Photocell turns nightlight on at night, off at dawn. Rated 15 amp, 125 volt and 1875 watts. Solid brass plug blades are firmly embedded in body. Resists chemical attack and is less brittle in extremely low temperatures. With terminal screw clamps. Combination Slot/Phillips head mounting and terminal screws for installation flexibility (Slot/ Robertson screws in Canada where available). Terminal screws backed out, ready for wiring. Yellow color. Meets all UL 498 requirements. Highly visible and easy to locate at the job sight. Molded out of impact and chemical resistant nylon. Neoprene gasket seals cord opening to protect against moisture, dirt, wood chips, etc. Temperature rating of -40 to 75 degrees C. 15 amp. UL 498 listed (file no.E15012), CSA Certified C22.2 no.42 (file no.2081) (6221-02) NOM Certified. NEMA 5-15. Carded. Highly visible and easy to locate at the job sight. Molded out of impact and chemical resistant nylon. Neoprene gasket seals cord opening to protect against moisture, dirt, wood chips, etc. Temperature rating of -40 to 75 degrees C. 15 amp. UL 498 listed (file no.E15012), CSA Certified C22.2 no.42 (file no.2081) (6221-02) NOM Certified. NEMA 5-15. Carded. Standard grade. Meets all UL 498 requirements. Terminals in individual chambers to positively insulate conductors. 15 amp, 125 volt. NEMA 5-15. UL Listed. 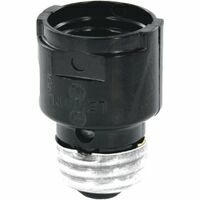 Energy saver power tap kills all residual energy. Illuminated on/off switch indicates when power is on. Green indicator light. Size: 2.5" D X 4.6" W X 4.6" H. Armored housing automatically grounded. Combination slot/Phillips head mounting and terminal screws. Terminal screw clamps. 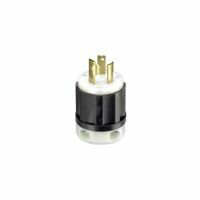 Fits Cooper plug number 2867, Orgill SKU 444.9625. 15 amp, 125 volt. NEMA 5-15 configuration. UL Listed, CSA and NOM Certified. 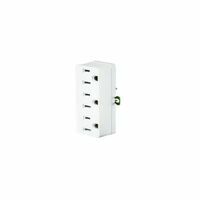 Converts duplex receptacle to six outlets. Molded of impact resistant plastic. 15 amp, 125 volt. UL Listed. Polypropylene ribbed body. Solid brass blades for long life and low heat rise at full load. 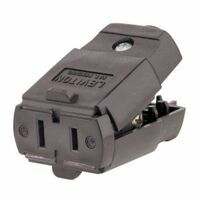 Converts 2 pole polarized outlet to 3 wire grounding outlet. Safety tab extends face on adapter to assure grouping plug cannot be plugged in incorrectly. 15 amp, 125 volt. UL Listed. Converts duplex receptacle to six outlets. Molded of impact resistant plastic. 15 amp, 125 volt. UL Listed. Terminals in individual chambers to positively insulate conductors. Terminal screw clamps are designed to contain wire and prevent binding. Terminal screws backed out, ready for wiring. Nylon Kwiklok features patented twist-actuated internal cord clamp, reduces installation time. Meets all UL 498 requirements. Yellow color. Leviton Armored Connector, Straight Blade, 250 V, 15 A, 2 Poles, 3 Wires, Nema: 6-15R, Cable Range: 0.245 - 0.7 in, Brass Contact, PVC/Steel Body, Yellow, NEMA WD-6 Enclosure, -40 TO 60 deg C, 2.56 in Length X 1.55 in Width, ANSI, CSA C22.2 NO 42, UL 498, 18 - 12 AWG, For Commercial Applications Leviton Armored Connector, Straight Blade, 250 V, 20 A, 2 Poles, 3 Wires, Nema: 6-20R, Cable Range: 0.245 - 0.655 in, Brass Contact, PVC/Steel Body, Yellow, 2.56 in Length X 1.55 in Width, CSA Certified, UL Listed, 18 - 12 AWG, For Commercial Applications For international use with dual voltage appliances or with electricity converters/transformers. 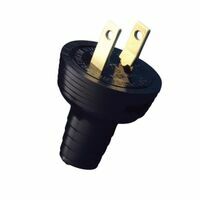 Accepts grounded appliance plugs from dozens of countries including North/South America, Caribbean and Japan as well as for European appliances used in the U.S. Medium to medium, 660 watts, 250 volts. Meets all UL 498 requirements. Terminals in individual chambers to positively insulate conductors. Combination slot/Phillips head mounting and terminal screws. UL Listed, CSA certified. Not NOM certified. Commercial grade, armored housing resists abuse. Solid brass plug blades are firmly embedded in body. Terminals in individual chambers to positively insulate conductors. 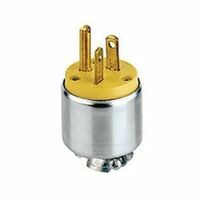 Accepts number 14 - number 10 AWG wire. NEMA 10-20P. UL498 Listed, file no. E15012; NOM certified. Temperature rating: -20 to +75 degrees Celsius maximum continuous. 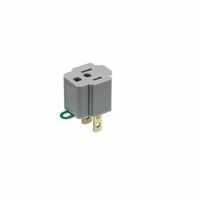 Leviton Electrical Plug, 2 Poles, 3 Wires, 15 A, Cord Mounting, Black/White, For Industrial Applications Leviton Connector Body, Straight Blade, 125 V, 20 A, 2 Poles, 3 Wires, Nema: 5-20R, Cable Range: 0.245 - 0.700 in, Brass Contact, PVC/Steel Body, Yellow, NEMA WD-6 Enclosure, -40 TO 60 deg C, 2.56 in Length X 1.55 in Width, ANSI, CSA C22.2 NO 42, UL 498, 18 - 12 AWG, For Commercial Applications Vinyl outlet lights up to indicate power is on. Solid one-piece clear construction with three outlets. 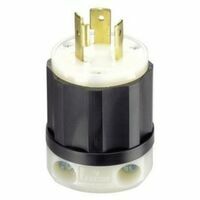 Use with sump pumps, appliances, and power tools. 15 amp - 125 volt - 1875 watt. 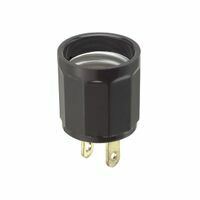 Lighted plug, 15 amp, 125 volt, NEMA 5-15P, 2pole, 3wire plug, straight blade. UL Listed, CSA Certified. 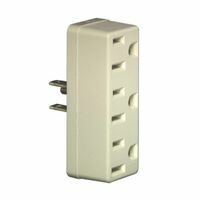 Space saver 6-outlet side entry wall adapter. Phone cradle, safety covers, wire wrap and easy pull design. 15 amp/125 VAC. 60 Hz, 1875 watts. Charging cradle. Indoor use only. Tri-lingual package, (English/French/Spanish). cULus Listed. Terminals in individual chambers to positively insulate conductors. Terminal screw clamps are designed to contain wire and prevent binding. Terminal screws backed out, ready for wiring. Nylon Kwiklok features patented twist-actuated internal cord clamp, reduces installation time. Meets all UL 498 requirements. Yellow color. Solid brass plug blades are firmly embedded in body. Resists chemical attack and is less brittle in extremely low temperatures. With terminal screw clamps. Combination Slot/Phillips head mounting and terminal screws for installation flexibility (Slot/ Robertson screws in Canada where available). Terminal screws backed out, ready for wiring. Yellow color. Meets all UL 498 requirements. Terminals in individual chambers to positively insulate conductors. 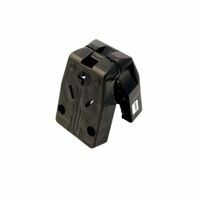 Terminal screw clamps are designed to contain wire and prevent binding. Terminal screws backed out, ready for wiring. Nylon Kwiklok features patented twist-actuated internal cord clamp, reduces installation time. Meets all UL 498 requirements. Yellow color. Terminals in individual chambers to positively insulate conductors. Terminal screw clamps are designed to contain wire and prevent binding. Terminal screws backed out, ready for wiring. Nylon Kwiklok features patented twist-actuated internal cord clamp, reduces installation time. Meets all UL 498 requirements. Yellow color. Socket to outlet, keyless switch. UL Listed, (file no. E15055). Meets all UL 496 and 498 requirements. NOM Certified. Temperature rating: -40 to +65 degrees C. 125 volt - 660 watts. Terminals in individual chambers to positively insulate conductors. Terminal screw clamps are designed to contain wire and prevent binding. Terminal screws backed out, ready for wiring. Nylon Kwiklok features patented twist-actuated internal cord clamp, reduces installation time. Meets all UL 498 requirements. Yellow color. Industrial grade. 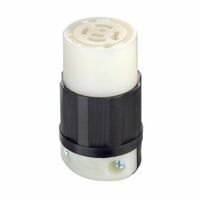 High impact-resistant thermoplastic housings with easy-grip grooves. Plated steel assembly screws are speed-threaded and captive, reducing installation time. Solid brass plug blades are firmly embedded in body. Clearly marked rating, NEMA configuration and standard compliances (third-party listing) on face of device. Color-coded clamps identify amperage: blue=15 amp. Terminal screws backed out; ready for wiring. Combination slot/Phillips head terminal, assembly, and clamping screws. Meets all 498 requirements. 15 amp, 125 volt. UL Listed. 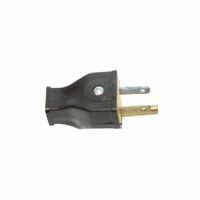 NEMA 5-15.
Cooper Wiring Angle Plug, Impact Resistant, Series: Arrow Hart, Safety Grip, 2 Poles, 3 Wires, 16 - 12 AWG Wire, 15 A, 125 VAC, Nema 5-15P, Cord Mounting, Grounding Grounding, Screw Connection, 1500 V Dielectric Strength, 2.06 in Overall Length, 1.28 in Overall Width, 1.46 in Overall Depth, Nylon, Black/White, -40 TO 75 deg C, 0.3 - 0.655 in Cord Neoprene gasket seals cord hole from dust. Individual wiring compartments with tapered channel for easy insertion of wires. Clear cover over wiring compartments for inspection of wiring terminations. Back wire terminal clamps for easy secure wiring. Dual range cord grip for solid cord clamping. cUL Listed, CSA Certified. 15 amp, 125 volt. .25" - .656" cord diameter. NEMA L5-15. 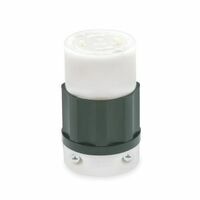 Compact design perfect for travel, Red and green charging indicator lights. Slim style surge tap. 20-percent faster charging. Three outlet cube. 15 amp, 125 volt. UL Listed, (file no. E15054), Meets all UL498 requirements, NOM Certified. Three outlet cube. 15 amp, 125 volt. UL Listed, (file no. E15054), Meets all UL498 requirements, NOM Certified. Highly visible and easy to locate at the job sight. Molded out of impact and chemical resistant nylon. Neoprene gasket seals cord opening to protect against moisture, dirt, wood chips, etc. Temperature rating of -40 to 75 degrees C. 15 amp. UL 498 listed (file no.E15012), CSA Certified C22.2 no.42 (file no.2081) (6221-02) NOM Certified. NEMA 5-15. Carded. Abuse resistant thermoplastic construction. External cable clamp provides firm strain relief. Back wire terminal clamps for easy secure wiring. Triple combination head screws standard - slot/Phillips/Robertson for use in the US and Canada. .25" - .69" cord diameter. Highly visible and easy to locate at the job sight. Molded out of impact and chemical resistant nylon. Neoprene gasket seals cord opening to protect against moisture, dirt, wood chips, etc. Temperature rating of -40 to 75 degrees C. 15 amp. UL 498 listed (file no.E15012), CSA Certified C22.2 no.42 (file no.2081) (6221-02) NOM Certified. NEMA 5-15. Carded. Hospital grade. Meets all UL 498 requirements. High-impact resistant thermoplastic housing. Solid brass plug blades. See-through terminal cover allows inspection of connections. NEMA construction and standard compliances. Color-coded clamps. 15 amp, 125 volt. Boxed. 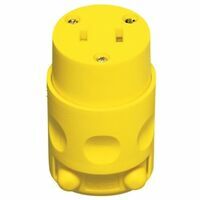 Leviton Electric Plug, Heavy Duty, Nema 6-20, Nylon, Yellow Leviton Cord Connector, 125 V, 15 A, 2 Poles, 3 Wires, Nema: 5-15R, Yellow Power tap with remote push-button switch. 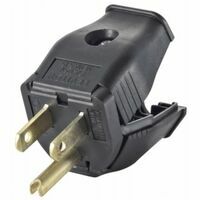 Includes extended 6 foot cord, 3 prong grounded outlet and foam padded feet. Abuse resistant thermoplastic construction. External cable clamp provides firm strain relief. Back wire terminal clamps for easy secure wiring. Triple combination head screws standard - slot/Phillips/Robertson for use in the US and Canada. .25" - .69" cord diameter. Abuse resistant thermoplastic construction. External cable clamp provides firm strain relief. Back wire terminal clamps for easy secure wiring. Triple combination head screws standard - slot/Phillips/Robertson for use in the US and Canada. .25" - .69" cord diameter. Abuse resistant thermoplastic construction. External cable clamp provides firm strain relief. Back wire terminal clamps for easy secure wiring. Triple combination head screws standard - slot/Phillips/Robertson for use in the US and Canada. .25" - .69" cord diameter. Abuse resistant thermoplastic construction. External cable clamp provides firm strain relief. Back wire terminal clamps for easy secure wiring. Triple combination head screws standard - slot/Phillips/Robertson for use in the US and Canada. .25" - .69" cord diameter. 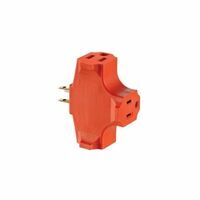 For replacement of plugs on tools, appliances and extension cords. Green neon light indicates power is flowing through to the cord. 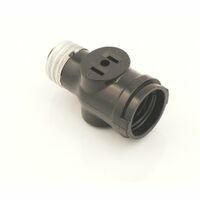 Built-in cord grip adjusts automatically for use with 18-12 AWG. cULus, NOM. UL Listed, (file no. E15055). Meets all UL 496 and 498 requirements. CSA certified, (file no. 1739 (6231-04). NOM Certified. Temperature rating: -40 to +65 degrees C. 250 volt, 660 watts. Abuse resistant thermoplastic construction. External cable clamp provides firm strain relief. Back wire terminal clamps for easy secure wiring. Triple combination head screws standard - slot/Phillips/Robertson for use in the US and Canada. .25" - .69" cord diameter. Abuse resistant thermoplastic construction. Back wire terminal clamps for easy secure wiring. External cable clamp provides firm strain relief. Individual wiring compartments with tapered channel for easy insertion of wires. Clear cover over wiring compartments allow easy inspection of wiring terminations. Triple combination head screws standard - slot/Phillips/Robertson for use in the US and Canada. Clearly marked rating, NEMA configuration and standard compliances on face. 20 amp - 125/250 volt. NEMA L14-20. Boxed. UL Listed, (file no. E15055). Meets all UL 496 and 498 requirements. CSA certified, (file no. 1739 (6231-04). NOM Certified. Temperature rating: -40 to +65 degrees C. 250 volt, 660 watts. 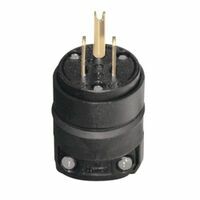 Leviton Connector Body, Straight Blade, 125 V, 15 A, 2 Poles, 3 Wires, Nema: 5-15R, Cable Range: 0.245 - 0.700 in, Solid Brass Contact, Impact Modified Nylon Body, Black, NEMA WD-6 Enclosure, -40 TO 60 deg C, 2.56 in Length X 1.49 in Width, ANSI, CSA C22.2 NO 42, NOM, UL 498, UL Fed Spec WC-596, 18 - 10 AWG, For Industrial Applications Industrial grade. High impact-resistant thermoplastic housings with easy-grip grooves. Plated steel assembly screws are speed-threaded and captive, reducing installation time. Terminals in individual chambers to positively insulate conductors. Clearly marked rating, NEMA configuration and standard compliances (third-party listing) on face of device. Color-coded clamps identify amperage: blue=15 amp. Terminal screws backed out; ready for wiring. Combination slot/Phillips head terminal, assembly, and clamping screws. Meets all 498 requirements. 15 amp, 125 volt. UL Listed. NEMA 5-15. Abuse resistant thermoplastic construction. External cable clamp provides firm strain relief. Back wire terminal clamps for easy secure wiring. Triple combination head screws standard - slot/Phillips/Robertson for use in the US and Canada. .25" - .69" cord diameter. Heavy duty, meets all UL 498 requirements. Furnished with blades for 30 and 50 amp configurations. Terminals have pressure plates to protect wires. NEMA 10-50. Abuse resistant thermoplastic construction. External cable clamp provides firm strain relief. Back wire terminal clamps for easy secure wiring. Triple combination head screws standard - slot/Phillips/Robertson for use in the US and Canada. .25" - .69" cord diameter. Abuse resistant thermoplastic construction. Back wire terminal clamps for easy secure wiring. External cable clamp provides firm strain relief. Individual wiring compartments with tapered channel for easy insertion of wires. Clear cover over wiring compartments allow easy inspection of wiring terminations. Triple combination head screws standard - slot/Phillips/Robertson for use in the US and Canada. Clearly marked rating, NEMA configuration and standard compliances on face. 20 amp - 125/250 volt. NEMA L14-20. Boxed. Abuse resistant thermoplastic construction. External cable clamp provides firm strain relief. Back wire terminal clamps for easy secure wiring. Triple combination head screws standard - slot/Phillips/Robertson for use in the US and Canada. .25" - .69" cord diameter. Abuse resistant thermoplastic construction. External cable clamp provides firm strain relief. Back wire terminal clamps for easy secure wiring. Triple combination head screws standard - slot/Phillips/Robertson for use in the US and Canada. .25" - .69" cord diameter. Converts single outlet into 5 grounded outlets. 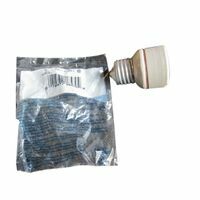 Outdoor rated for use on construction sites or for DIY outdoor lighting projects. Two cord locks secure cords and prevent disconnection. 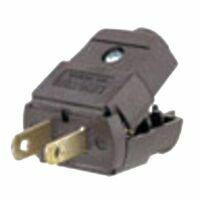 Cord locks accommodate 16/3-10/3 SJT (300 volt) cords up to 12/3 ST (600 volt) cords. Durable overmolded vinyl jacket for long life in rugged applications. Rated 125 volt/15 amp/1875 watt. UL Listed. USB charger, folding plug, Compact design perfect for travel. 20-percent faster USB charging. Three outlet cube. 15 amp, 125 volt. UL Listed, (file no. E15054), Meets all UL498 requirements, NOM Certified. 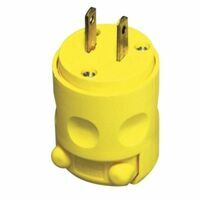 Converts 220 volt foreign electricity to 110 volt for use on most US appliances rated 0-50 watts. Continuous 35 watts.Maximum 50 watts. 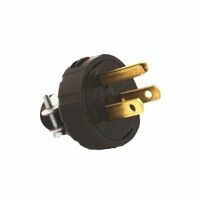 Converts 120 volt domestic electricity to 240 volt for use on most foreign appliances rated 0-50 watts. Continuous use on 0-30 watt appliances. 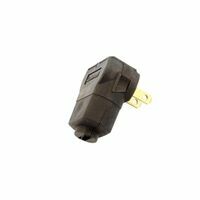 Intermittent use on 31-50 watt appliances. Compact with convenient travel pouch. Heavy duty. Blades included for 30 and 50 amp configurations. Terminals have pressure plates to protect wires. UL and cUL Listed, NOM Certified, meets all CSA requirements. NEMA 14-30 or 14-50. 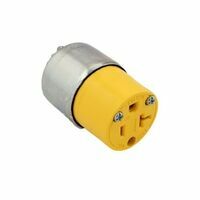 Combination of the four most common adapter plug configurations in one compact unit, has EMI/RFI power line protection, surge protection and accepts grounded/nongrounded, polarized plugs from Europe, Asia, Australia, Africa, North and South America. Power light, safety shutters and travel pouch included. 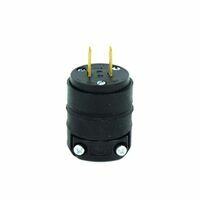 775 volt clamping voltage, 149.8 joules dissipation. Abuse resistant thermoplastic construction. Back wire terminal clamps for easy secure wiring. External cable clamp provides firm strain relief. Individual wiring compartments with tapered channel for easy insertion of wires. Clear cover over wiring compartments allow easy inspection of wiring terminations. Triple combination head screws standard - slot/Phillips/Robertson for use in the US and Canada. Clearly marked rating, standard compliances on face. 30 amp - 125/250 volt. NEMA L14-30. Polypropylene ribbed body. Solid brass blades for long life and low heat rise at full load. 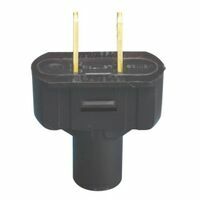 Converts 2 pole polarized outlet to 3 wire grounding outlet. Safety tab extends face on adapter to assure grouping plug cannot be plugged in incorrectly. 15 amp, 125 volt. UL Listed. 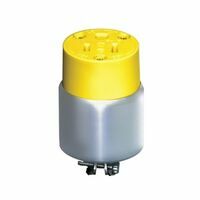 Used for marine applications in areas of water or moisture. Thermoplastic elastomeric (TPE) exterior. Glass filled nylon and glass filled polypropylene interior. 15 amp, 125 volt. Temperature rating of -40 to 70 degrees C. Listed to UL 498 (file no.E3663) and watertight. NEMA 5-15.
Cooper Wiring Plug and Connector, Ultra Grip, 3 Poles, 4 Wires, 16 - 12 AWG Wire, 20 A, 480 V, 3 Phase, Nema L16-20, Grounding Grounding, Back Wired Connection, 4.79 in Overall Length, Nylon, Black/White, -40 TO 60 deg C, For Industrial Applications Nylon construction. Neoprene gasket seals cord hole from dust and debris. Inserts included for three separate cord grip ranges. Back wire terminal clamps for easy secure wiring. Individual wiring compartments with tapered channel for easy insertion of wires. Clear cover over wiring compartments allow easy inspection of wiring terminations. Combination head screws standard - slot/Phillips in the US. 20 amp - 125/250 volt. NEMA L10-20. Boxed. Hospital grade. Meets all UL 498 requirements. High-impact resistant thermoplastic housing. See-through terminal cover allows inspection of connections. NEMA construction and standard compliances. Color-coded clamps. 15 amp, 125 volt. Boxed. 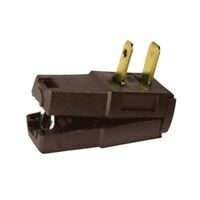 Cooper Wiring Connector Body, Series: Ultra Grip, 480 V, 30 A, 3 Phase, 3 Poles, 4 Wires, Nema: L16-30, Cable Range: 0.38 - 1.16 in, Bronze, Tin Plated Contact, Nylon Body, Black/White, -40 TO 60 deg C, 3.84 in Length, cULus Listed, NAFTA Approved, RoHS Complaint, 16 - 8 AWG, For Industrial Applications Dual wattage, converts 200 volt foreign electricity to 110 volt. Hi/Lo power selector switch. Low setting, 0-25 watts for shavers, battery chargers, etc. 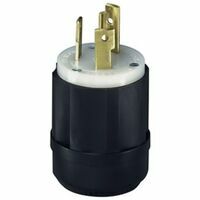 High setting, 26-1875 watts for irons, hair dryers, etc. Set includes 5 adapter plugs and zippered travel pouch. For use with U.S. appliances overseas. 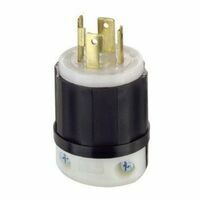 Converts foreign electricity (220/240 volt) to 110/120 volt. Fits electrical outlets in most commonly visited countries. Built-in surge protector keeps electrical appliances safe from spikes in foreign electricity. Adapter only or adapter/converter combo modes. 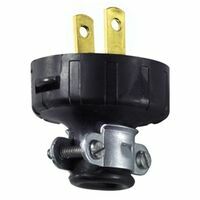 Leviton Locking Connector, 125 V, 30 A, 3 Poles, 4 Wires, Nema: L14-30R, Cable Range: 0.595 - 1.15 in, Solid Brass Contact, Impact Modified Nylon Body, Black/White, NEMA WD-6 Enclosure, -40 TO 60 deg C, 3.78 in Length X 2.22 in Width, ANSI, CSA C22.2 NO 42, NOM, UL 498, UL Fed Spec WC-596, 2 hp, For Industrial Applications Meets all UL 498 requirements. Plug blades firmly embedded in body. Size: 1.48" wide x 1.19" tall. 15 amp, 125 volt. .312" cord diameter. NEMA 1-15. General duty, meets all UL 498 requirements. Plug blades are firmly embedded in body. 15 amp, 125 volt. .328" cord diameter. NEMA 1-15. Standard grade. 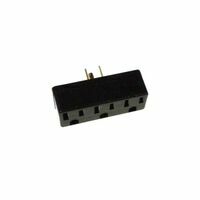 Connectors meet all UL 498 requirements. Resists chemical attack and stays flexible in extremely low temperatures. Polypropylene, PVC and thermoplastic rubber. Meets flammability requirements per UL 94. 15 amp, 125 volt. -20 to +70 degrees C. NEMA 1-15. Boxed. Senses and selects high (50-2000 watt) or low (0-49 watt) setting. 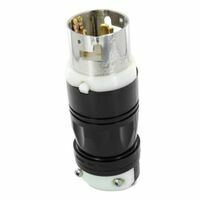 Converts 220 volt foreign electricity to 110 volt for use on low wattage (0-49 watts) appliances such as electric shavers, radios, etc. and for high wattage (50-2000 watts) appliances such as irons, steamers, some hair dryers, etc. Solid state circuitry with high/low wattage indicator lights. Circuit breaker reset button corrects accidental overloads. Set includes 5 polarized adapter plugs to accommodate most foreign outlets and a zippered travel/storage pouch. Plug blades are firmly embedded into insulating body. 15 amp, 125 volt. .406" cord diameter.